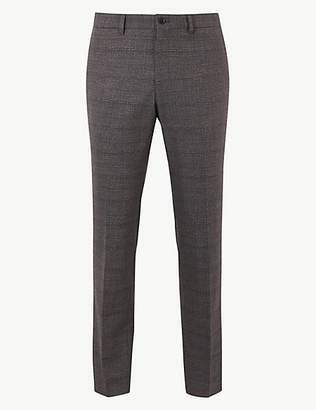 With a refined checked pattern and brushed finish for a touch of texture, these men's trousers are sure to keep you right on trend. Tailored for a stylish skinny fit, our checked trousers will add a contemporary edge to any wardrobe, while added stretch offers exceptional comfort hour after hour. Team with a smart shirt for a formal look to see you from office meetings to evening get-togethers in style. "64% polyester, 32% viscose and 4% elastane "